Children’s individual accomplishments big and small should be celebrated, and the “I’m Proud Of You” Family Festival movement aims to dedicate a day each year to just that, providing parents with the perfect opportunity to appreciate their children’s little victories. This Children’s Day MindChamps invites you to come ride on a real life Pony, clumber over 6 mega unique inflatable obstacle courses, be entertained by roving jugglers, stilt walkers, magicians, meet & greet Pororo and Friends and marvel at the delights of the night sky with the STARLAB Planetarium and so much more! 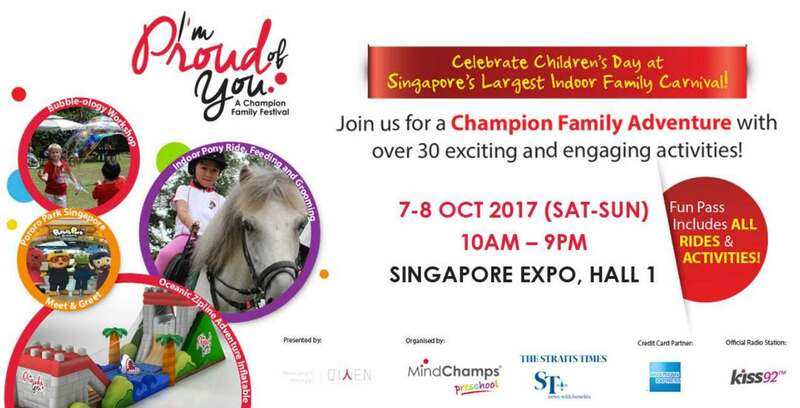 In collaboration with MindChamps Singapore , we are giving away $1,720 worth of tickets* to “I’m Proud of You” – Family Festival happening this Children’s Day Weekend (7th-8th Oct, 10am-9pm). 2) TAG as many friends in this post! Contest ends 24th September 2017, 10pm. 10 random lucky families will be chosen and announced on 26th September 2017. Find out more at Pororo Park Singapore.